Vans World Cup of Surfing the 2nd jewel in the Triple Crown runs from November 25th through December 6th at Sunset Beach, Hawaii. 2012 Sunset Master Adam Melling will be looking for another good event. This is the last ASP Prime for 2013 and Stu Kennedy really needs a big result to determine his plans for next year. Good luck fellas. BRIEF OVERVIEW: A new pulse of decent size NW swell shows by Tuesday the 26th with overhead sets at Sunset and easterly Trades. That swell eases through mid week, but a possible large NW swell may charge the North Shore by Friday the 29th. Conditions over the second half of the new week are still suspect at this time, as a front moves into the region. 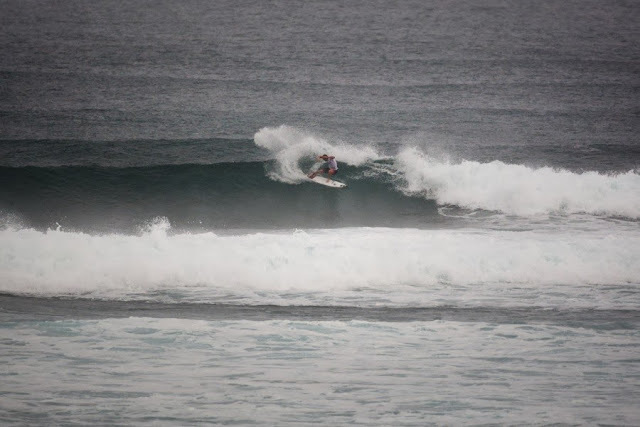 Stu took some big drops and laid some serious rail in the 12' - 15' waves but unfortunately couldn't find the sections offering higher scoring potential and was eliminated. Congratulations on a great year Stuey. Mello had a comfortable win in the smaller conditions today . He showed his experience in the Sunset line up by waiting for the right waves to get the bigger scores. Adam moved from 4th to 1st after the hooter because he is the Iceman or possibly a magician. He surfs next in the first heat in the round of 32. Adam led his Quarter Final from the start and moved into the Semis. He surfed really well in the semi but Huey didn't send him the bombs. Mello finished the event in 7th with 3200 points and is an outside chance for the Triple Crown again.